A magical place, in summer as well as in winter. The farm and the chalet enjoy a southerly view on the Puys de la Croix Morand, Tasche, Monne and l'Angle and on the Monts Dore. Surely one of the most beautiful views of Auvergne! Spend a few days with your family or friends? Be alone to work better together? Come together in a group to discover the Mont-Dore region? Organize a yoga or personal development course? Rehearse, create, train, coach in a calm setting? 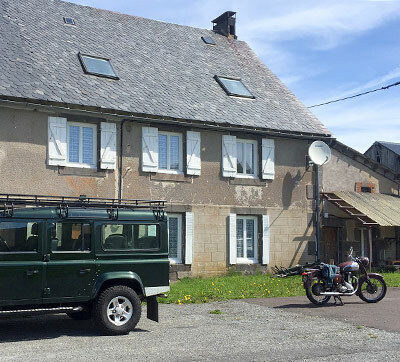 Sportspeople, party-goers, artists, motorcyclists, companies, all can enjoy an exceptional and isolated place, benefitting from the closeness of the Auberge, located at 800 m, and the nearby Mont-Dore. The barn of the farm: an open space of 700 m², with a height of 6 m under ridge, is proposed to you for meeeting in groups: seminars, performances, creative activities, etc. Please contact us directly for any request concerning the annexes of the Auberge du Lac de Guéry, a stone's throw from Mont-Dore.